Check-in for American Airlines is in Terminal 3 at London Heathrow. The space is well branded and is very quiet with no queues. I use the self-check-in units which seem quite dated and slow and the process takes in excess of 5-minutes. Boarding is completed in a zonal format, and is well applied – the flight is quite quiet and the process is completed well in advance of the stated departure time. At the aircraft door, there is a cursory welcome with basic guidance to the seat position. Staff distribute complimentary headsets and aside from the safety checks (which are thorough and well completed) this is the only staff activity prior to take-off. Boeing 777-200 in Economy Class, which was at 60% capacity and I have a spare seat next to me. For the Economy Class fare purchase customers are permitted 1 x checked baggage with a maximum weight 23kg (50lbs) with dimensions not to exceed 60-inches. For carry-on, passengers can take 1 x personal item of 18x14x8 inches (45x35x20 cm) which must be able to fit under the forward seat if necessary and 1 x cabin bag of 22x14x9 inches (56x36x23 cm) – there appears to be no upper weight limit on these items. The main Economy Class cabin is configured in the higher density 3x4x3 layout – the seat pitch feels good, even with the forward seat reclined. The width feels fine (although I have spare seat next to me), although its likely to feel narrow at the shoulders for larger passengers. The seat offers both 110v power and USB sockets which are easily accessible. There is a 10.6-inch widescreen PTV monitors which offers both touchscreen functionality and separate handset – overall, it is a perfectly satisfactory seat for this 11-hour flight, however, comfort levels maybe somewhat weaker on a busier service. The is well presented on boarding – carpets, seat covers and windows are clean. The seats are upholstered in a pleasant tartan style blue covers which retains good colour are the carpets are similarly well presented. The adjustable leather headrests have no covers, but appear clean on boarding. Washrooms remains quite clean throughout the flight but I would suggest this is due more to passenger discipline rather than any staff intervention as I do not observe any sort of cleaning checks during the flight. The flight pushed back more or less on time – the taxi to the runway and subsequent wait takes approximately 30-minutes. Shortly after the seatbelt sign is turned off the first bar service is offered. This offers the usual main brand soft drinks, white wine, red wine and beer. Tea and coffee are also available on this first bar cart which is a pleasant surprise. AA serves full cans of soft drinks and beer and the bar service cup is quite large (I would estimate at least a third bigger than average) so wine servings are also generous. A trash run is completed shortly afterwards, and the delivery of meal trays follows around 15-minutes later. Meals are offered as a basic choice of chicken or pasta, but the dialogue is quite pleasant and passengers are wished a pleasant meal. A second full bar service follows shortly after the meal tray. The meal tray is a good size and not too cramped – there is a green salad appetiser which is served with an Italian dressing, this is fresh and pleasant. I opt for the chicken entrée. This offers a decent size chicken portion with mash potato, green beans and a barbecue flavoured sauce – the flavour is very good and all elements of the meal are well cooked. The is a small packaged ciabatta style bread – this is served chilled but the flavour and texture are fine. The dessert is a packaged apple crumble cake – it is small but the flavour is satisfactory. There is a butter portion, soft cheese spread and crackers to complete the meal tray – overall, the quantity and quality of food is very satisfactory. There is also a bottle of French mineral water. The cutlery is plastic but quite strong – it stands out as one of the weaker items on the meal tray but is perfectly functional. A third and final bar service is offered and the overall quantity of drinks offered is more than satisfactory. Impressively, as the flight is not too busy, meal trays are cleared on-demand as one finishes the meal and such there is no long wait for the final cabin clearance. In the galley, there was water and passengers could request further soft drinks. There was a self-serve box of cakes, potato chips and pretzels – it was a decent offer overall. Mid-flight the staff serve a small pot of UK artisan ice cream which is pleasant. 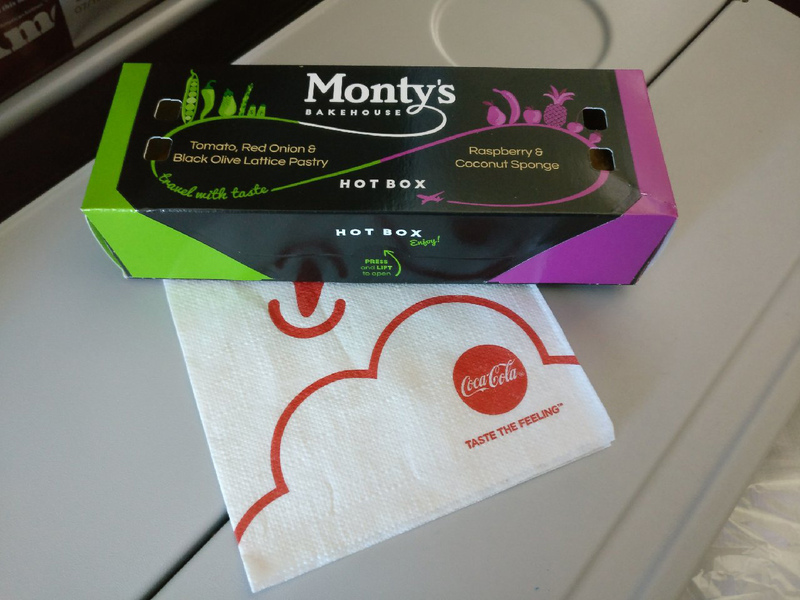 Prior to arrival there is a hot snack box which contains a savoury and sweet pastry – these are now quite common on many global airlines and the quality is satisfactory. Overall, the quantity of food available is not bad but this is largely because one can pick at items in the galley if hungry. 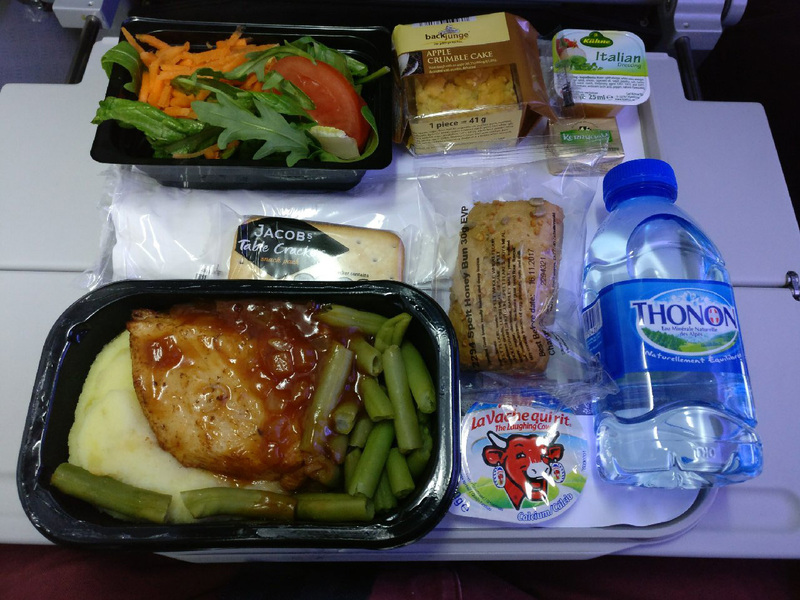 For airlines in most other global regions, one would expect a more substantial second meal service (e.g. a hot entrée). IFE is available gate to gate is only interrupted by the safety display and a pre-recorded post departure announcement. The content is very satisfactory and covers a wide range of film and television viewing options. There are 288 movies options and this includes approximately 40 foreign language titles, international choices in Japanese, Korean, Spanish, French and Chinese amongst others and there are 15 choices for children. For TV, there is a wide range of options which mainly covers popular US television for comedy and drama with some factual programming choices. The seasons range from anything between 1 and 12 episodes and the majority offer 4 or 5 episodes. At the boarding gate in Heathrow there is a decent selection of magazines and newspapers that customers can select from. 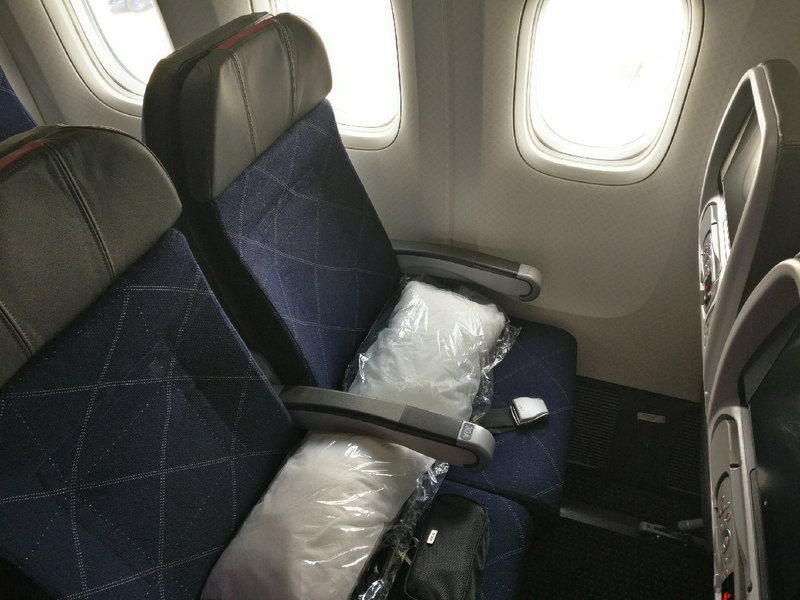 Pillows and blankets are available on each seat and these meet an adequate standard. In the washroom, there is only hand soap and no additional moisturiser / hand lotion. There was no comfort kit (eye mask etc) on this flight and AA do not offer any sort of hot towel service. I was quite impressed with the staff service overall – the crew encountered were interactive and chatty during the meal and made a decent effort to be present outside of the main meal services. Whilst I would not describe the staff as overly friendly, this was certainly one of the better US airline flights I have had in recent times. 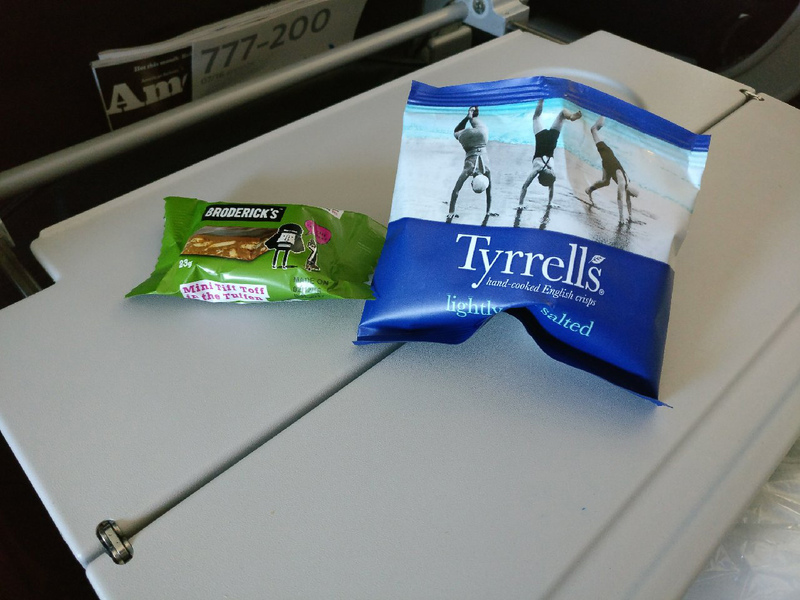 I was offered several drinks mid-flight (without having to use the call bell) and it was a pleasant surprise that the staff also serve some of the galley snacks at the same time. There are the usual meet and greet staff available on arrival into Los Angeles but these are largely for special assistance rather than a designated arrivals / transfer service. Immigration queues are moderate and baggage arrives within 15-minutes of reaching the reclaim belt. 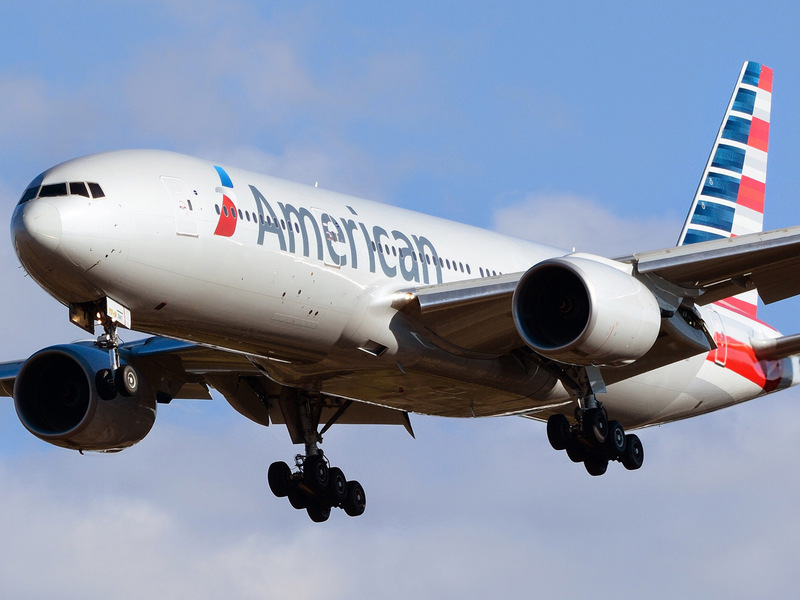 This was a broadly positive experience with American Airlines for this flight from London to Los Angeles – the onboard product is satisfactory but this is with the caveat that the flight was quiet and most passengers had an empty seat next to them. 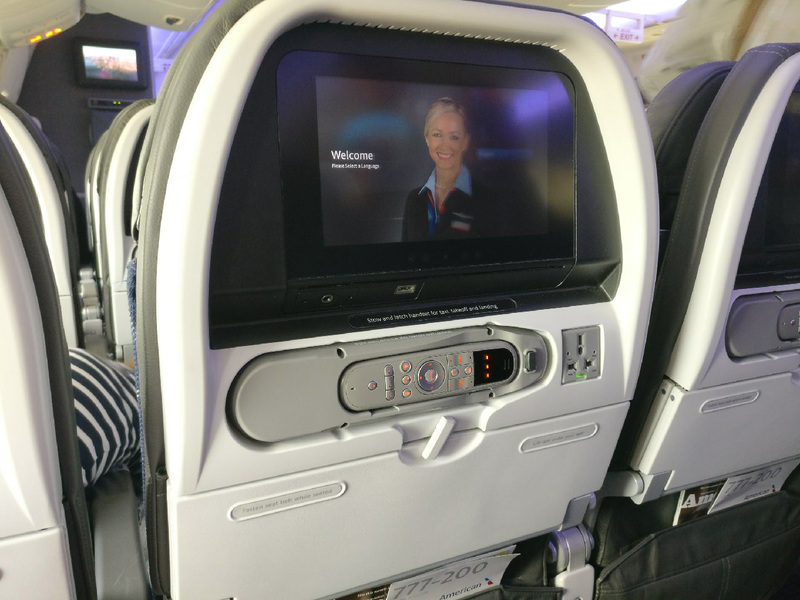 The IFE stands well against most carriers I’ve recently experienced across a range of global regions, and seat comfort is also good. Staff service was quite pleasing and for me, (rightly or wrongly) was above expectation. 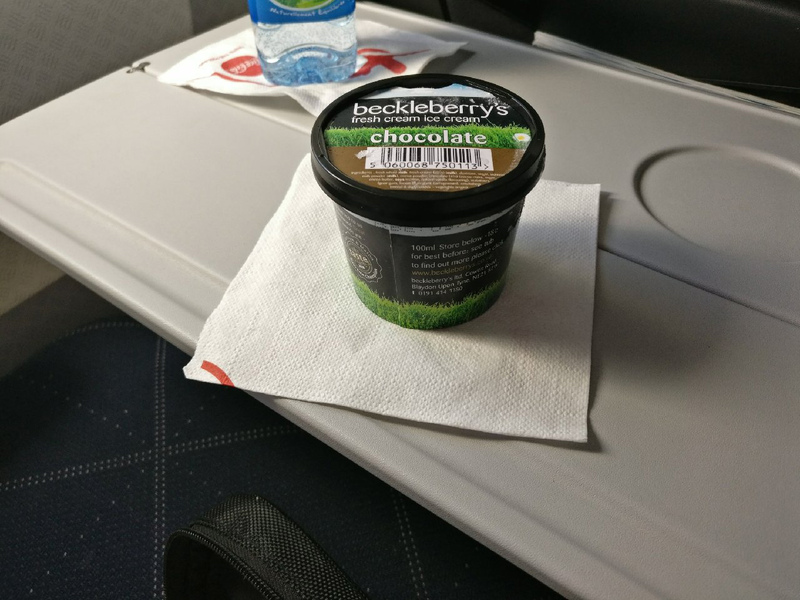 I felt the catering product provided was decent for the flight duration and departure time, but those used to Asian, Middle East (and even many European) airline standards may consider it a little economical.